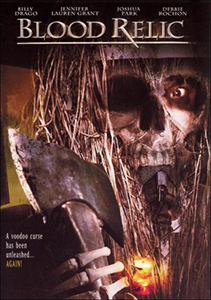 Director/Writer: J. Christian Ingvordsen / Writer: Matthew Howe / Cast: Joshua Park, Jennifer Lauren Grant, Debbie Rochon, John Christian, Kelly Ray, Jesse Steccato, Caitlin Saibins, Melanie Radermaker, Meyer de Leeuw, Billy Drago, Lawrence Starr. An air force officer goes ape and kills four others at a base before hiding the talisman he wears and turning himself in. Twenty-three years later he’s released and immediately returns to reclaim the pendant. Unfortunately for him, the base has since been turned into a struggling museum and one of the student employees has found the object. When the youthful employees gather together for an after-hours party a pilot uniformed psycho begins stalking and slaughtering them. This cheap production wastes little time in cutting to the murder spree, but once it’s underway things surprisingly become a bit slow and tedious with long, drawn out scenes of dialogue (“cursed talisman blah blah blah…”) and contrived situations that serve to trap the victims inside the old hangar. There are some wild oversights – mainly the fact that the reformed killer hasn’t aged at all in over twenty years – and why does the killer bother removing one girl’s clothes before killing her? Debbie Rochon brightens things up as one of the fleeing students, and the identity of the killer isn’t quite as obvious as it initially seems. With a more generous budget, this take-it-or-leave-it video flick could’ve carried minor cult appeal. Blurbs-of-interest: Debbie Rochon’s other slasher appearances include American Nightmare, Bleed, Final Examination, Head Cheerleader Dead Cheerleader, and Varsity Blood.